Frugal Tractor Mom: Early Rise Brings a Prize! This Saturday started really early for us! 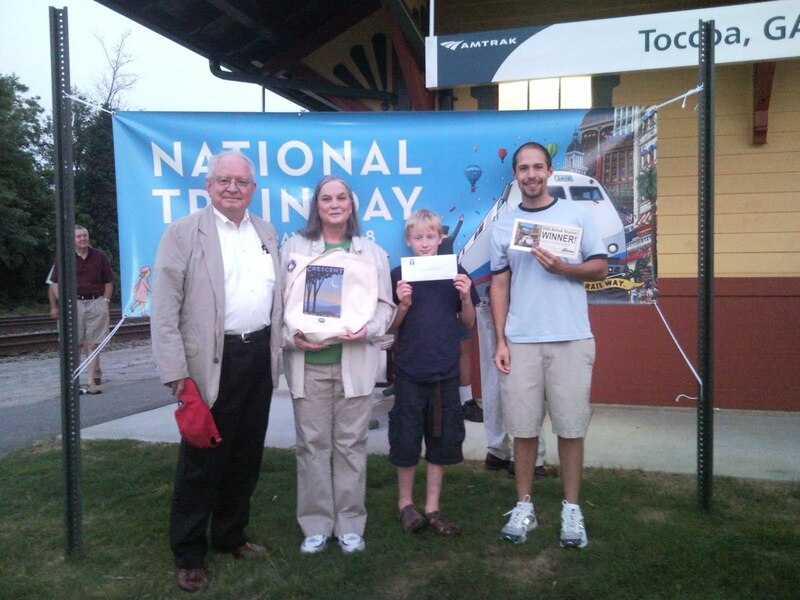 We joined about 80 or so folks to welcome the Amtrak Crescent line into Toccoa for National Train Day. I live with train nutts in my house! My Hubby and Knox love just watching the trains go by. So Saturday morning we were up and made it to downtown Toccoa just in time to watch the Crescent stop. The Crescent came in right on time--6:10 am! As the Crescent leaves Toccoa, it leaves with our mayor, Bob Troup and his wife Betty as well as Sharon Crosby who handed out goodie bags from the city of Toccoa and the Chamber of Commerce. It's a pretty cool thing our little town does every year! We're one of only 3 stops that Amtrak makes in Georgia! There are over 3000 people that get on and off the train at our depot and we don't even have a ticket office! But what we always look forward to are the prizes that the City of Toccoa gives away after the train pulls out. Last year Knox won a really awesome print celebrating the Amtrak's Crescent Line. Since we got there a little late, I almost forgot to register for the prizes. So right before the prizes were drawn for, I put all our names in for the drawing. As Hubby and I stand talking to friends we get the word that they are calling for Knox. He won AGIAN!! He won two free round trip tickets to Atlanta! This is the second year in a row that he won! UNBELIEVABLE! It wasn't the Grand Prize, but don't tell Knox that! I'll say it again...I love my home town! It just gets better the older I get! It's a wonderful place to raise a family and to call home! Saturday, I think, maybe some folks on their way to New Orleans learned that too! What a fun way to spend a Saturday! 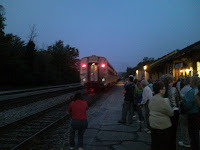 We love trains around here too. 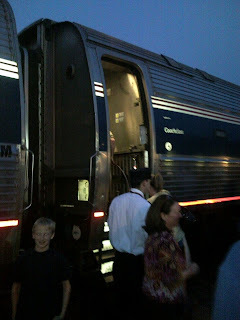 A couple of years back my husband and I were able to take a train ride to the Grand Canyon. It was awesome and we hope to be able to take our son there sometime too. Thanks for stopping by my blog and commenting. I love my Desert Rose and Apple dishes. I inherited both sets! One came from my mother in law and the other from my Grandmother.